Investors, analysts and financial journalists use different measures of value to make their investment cases and it is not a surprise that these different value measures sometimes lead to confusion. For instance, at the peak of Apple's glory early last year, there were several articles making the point that Apple had become the most valuable company in history, using the market capitalization of the company to back the assertion. A few days ago, in a reflection of Apple's fall from grace, an article in WSJ noted that Google had exceeded Apple's value, using enterprise value as the measure of value. What are these different measures of value for the same firm? Why do they differ and what do they measure? Which one is the best measure of value? What are the different measures of value? Note that operating assets include not only fixed assets, but also any intangible assets (brand name, customer loyalty, patents etc.) as well as the net working capital needed to operate those assets and that debt is inclusive of all non-equity claims (including preferred equity). Let's start with the market value of equity. 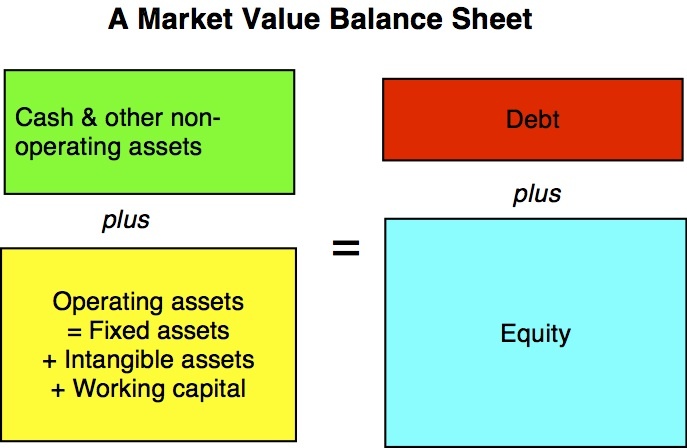 Rearranging the financial balance sheet, the market value of equity measures the difference between the market value of all assets and the market value of debt. 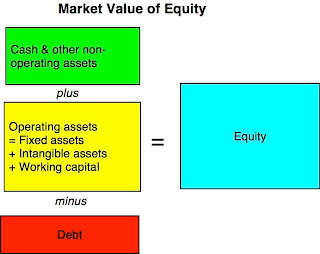 The second measure of market value is firm value, the sum of the market value of equity and the market value of debt. Using the balance sheet format again, the market value of the firm measures the market's assessment of the values of all assets. The third measure of market value nets out the market value of cash & other non-operating assets from firm value to arrive at enterprise value. With the balance sheet format, you can see that enterprise value should be equal to the market value of the operating assets of the company. One of the features of enterprise value is that it is relatively immune (though not completely so) from purely financial transactions. A stock buyback funded with debt, a dividend paid for from an existing cash balance or a debt repayment from cash should leave enterprise value unchanged, unless the resulting shift in capital structure changes the cost of capital for operating assets, which, in turn, can change the estimated value of these assets. 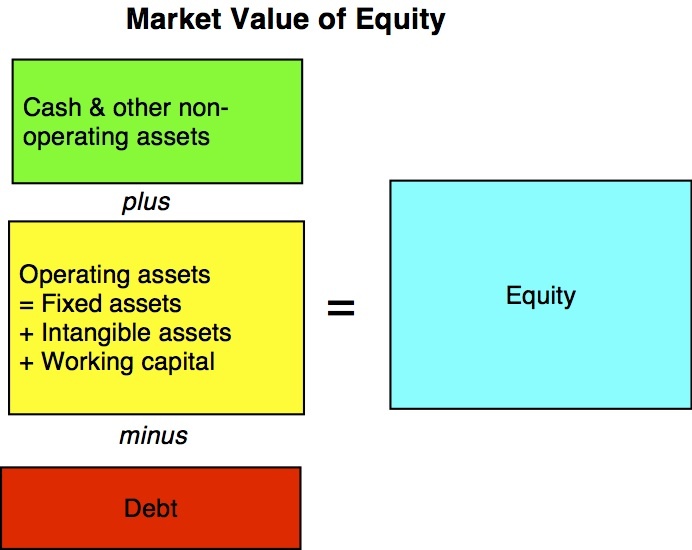 To arrive at the market values of equity, firm and enterprise, you need updated "market" values for equity, debt and cash/non-operating assets. In practice, the only number that you can get on an updated (and current) basis for most companies is the market price of the traded shares. To get from that price to composite market values often requires assumptions and approximations, which sometimes are merited but can sometimes lead to systematic errors in value estimates. Non-traded shares: There are some publicly traded companies with multiple classes of shares, with one or more of these classes being non-traded. Though these non-traded shares are often aggregated with the traded shares to arrive at share count and market cap, the differences in voting rights and dividend payout across share classes can make this a dangerous assumption. If you assume that the non-traded share have higher voting rights, it is likely to you will understate the market value of equity by assigning the share price of the traded shares to them. Management options: The market value of equity should include all equity claims on the company, not just its common shares. When there are management options outstanding, they have value, even if they are not traded, and that value should be added to the market capitalization of the traded shares to arrive at the market value of equity in the company. For a company like Cisco, this can make a significant difference in the estimated market value of equity (and in the ratios like PE that are computed based on that market value). Again, using short cuts (such as multiply the fully diluted number of shares by the share price to get to market capitalization) will give you shoddy estimates of market value of equity. Convertible securities: To the extent that a company raised funds from the use of bonds or preferred stock that are convertible into common equity, the conversion option should technically be treated as part of the value of equity (and not as debt or preferred stock). Failing to do so will understate the market value of equity in companies with lots of convertible securities outstanding. Non-traded debt: The problem of non-trading is far greater with debt than equity, because bank debt is a large proportion of overall debt, even for many companies that issue bonds, and is the only source of debt for companies that don't issue bonds. 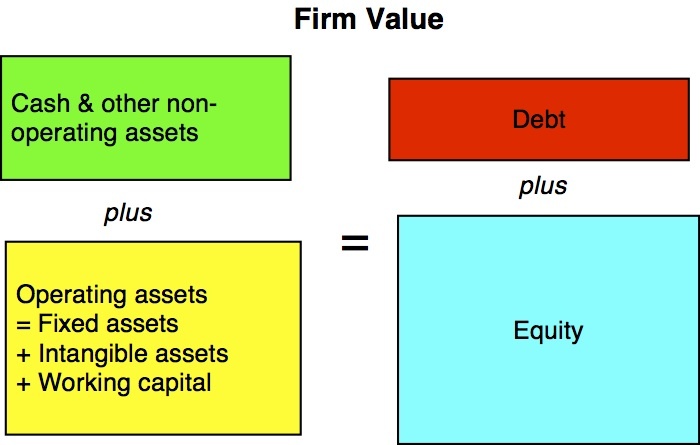 Lacking a market value, many analysts have resorted to using book value of debt in their firm value and enterprise value computations. Though the effect of doing so is relatively small for healthy companies (book values of debt are close to market values of debt), it can be large for distressed companies, where the book value of debt will be far higher than the market value of that debt, leading to much higher estimates of enterprise and firm value for these firms than is merited. Off balance sheet debt: To the extent that firms use off-balance sheet debt, we will understate the firm and enterprise values for these firms. While this may sound like a problem only with esoteric firms that play financing games, it is actually far more prevalent, if you recognize lease commitments as debt. Most retailers and restaurant companies have substantial lease commitments that should be converted into debt for purposes of computing firm or enterprise value. Operating versus non-operating cash: To the extent that some or a large portion of the cash balance that you see at a company may be needed for its ongoing operations, you should be separating this portion of the cash from the overall cash balance and bringing into the operating asset column (under working capital). There are two problems we face in making this distinction between operating and excess cash. The first is that operating cash needs will be different across different businesses, with some businesses requiring little or no operating cash and others requiring more. The second is that cash needs have changed over time, with a shift away from cash based transactions in many markets and companies collectively require less cash than they used to a few decades ago. Analysts and investors, for the most part, have no stomach for making the distinction between operating and non-operating cash on a company-by-company basis and use one of two approximations. The first is to assume no operating cash and treat the entire cash balance as excess cash in computing enterprise value. The second is to use a rule of thumb to compute operating cash, such as setting cash at 2% of revenues for all firms. Again, while either approach may do little damage to value estimates at the typical firm, they will both fail at exceptional firms, where the cash balances are very large (as a proportion of value) but are untouchable because they are is needed for operations. Trapped cash: In the last decade, US companies with global operations have accumulated cash balances from their foreign operations that are trapped, because using the cash for investments in the US or for dividends/buybacks will trigger tax liabilities. If a company has a very large cash balance and a significant portion of that cash is trapped, it is possible that the market attaches a discount to the stated value to reflect future tax payments. Netting out the entire cash balance to get to enterprise value will therefore give you too low an estimate of enterprise value, a point to ponder when netting out the $145 billion (with >$100 billion trapped) in cash to get to Apple's enterprise value. When companies have non-cash assets that are non-operating, your problems start to multiply. With many family group companies, where cross holdings are the rule rather than the exception, the effect of miscalculating the value of non-operating assets can be dramatic. Cross holdings in other companies: When a company has non-controlling stakes in other companies, the market value of these holdings should be netted out to get to the enterprise value of the parent company. Doing so may be straightforward if the cross holdings are in other publicly traded companies, where market prices are available, but it will be difficult if it is in a private business. In the latter case, the value of the cross holding on the balance sheet will, in most cases, reflect the book value of the investment, with little information provided to estimate market value. The problems become worse if there are dozens of cross holdings, rather than just a handful. Not surprisingly, most analysts completely ignore cross holdings in computing enterprise value and the remaining net out the book value of the holdings. For companies that derive a large proportion of their value from cross holdings, this will lead to an upwardly biased estimate of enterprise value. When a company has a controlling or a majority stake in another company, a different kind of problem is created when computing enterprise value. The market value of equity in the parent company reflects only the majority stake in the subsidiary but the debt and cash in the computation are usually obtained from consolidated balance sheets, which reflect 100% of the subsidiary. To counter this inconsistency, analysts add the minority interest (which is the accountant's estimate of the equity in the non-owned portion of the subsidiary) to arrive at enterprise value, but the minority interest is a book value measure. Double counting of operating assets: One of the real dangers of fair value accounting and its push to bring more invisible or intangible assets to the balance sheet is that it increases the risk that analysts will double count. Thus, even if brand name and customer lists are valued and put on the balance sheet, they are very much part of the operations of the firm and should not be netted out as non-operating assets. Only assets that don't contribute (and are never expected to contribute) to operating income can be treated as non-operating assets. Looking at the standard practices in value estimation, there are two clear inconsistency problems that you see crop up. One is in the mixing of market values, estimated values and book values for different items in the computation. The other and related question is that the market values can be updated constantly but the book value based numbers are as of the last financial statement. In a typical enterprise value computation, the only number that comes from the market is the market capitalization, reflecting the market value of equity in common shares. The remaining numbers all come from accounting statements and reflect accounting estimates of value, with varying implications. With debt, as we noted, the difference between book and market value is likely to be small for healthy firms but much larger for distressed companies. With cash, the accounting estimates of value should be close, with the caveat that trapped cash may be discounted by the market to reflect expected tax liabilities. With cross holdings, the gap between book and market value can vary depending on how old the holding is (with older holdings have larger gaps) and the accounting for that holding. While getting true market values for bank debt and cross holdings may be a pipe dream, there is no reason why we cannot estimate the market values for both. For debt, this will require using the interest expenses and average maturity on the debt to compute an estimated market value of the debt (akin to pricing a coupon bond). With cross holdings (minority holdings and interests), it may require us to use sector average price to book ratios to estimate the values of the cross holdings. While you would like values to be current (since your investment decisions have to reflect current numbers), only market-based numbers can be updated on a continuous basis. The only market-based number in most enterprise value calculations is the market capitalization number (reflecting current stock prices), with the other numbers either directly coming out of accounting statements (debt, cash) or indirectly dependent on information in them (options outstanding, lease commitments). There are two questions, therefore, that you have to confront: (a) Should you try for timing consistency or current value? (b) If you go current value, what types of biases/problems will you face because of the timing mismatch? Consistency versus Current Values: If you are using the value estimates to look at how values change over time or why values have varied across companies in the past, consistency may win over updating. Thus, rather than using the current market value of equity, you may use the market value of equity as of date of the last financial statement. If you using the value estimates to make investment or transaction judgments today, the current value rule should win out. After all, if you find a company to be cheap, you get to buy it at today's price (and not the price as of the last financial statement). Biases/Errors from Time mismatches: Assuming that the need to be updated wins out, your biggest concern with using dated estimates of debt, cash and other non-operating assets is that their values may have shifted significantly since the last reporting date. Not only can companies borrow new debt or repay old debt, which can affect the cash balance, but the operating needs of the company can lead to a decline or augmentation in the cash. For young growth companies, with large investment needs and/or operating losses, the cash balance today can be much lower than it was in the last financial statement. For mature companies in cashflow-rich businesses, cash balances can be much higher than in the last financial statement. In fact, the mismatch can sometimes lead to strange results, especially for young, growth companies that have had operating/financial/legal problems in the very recent past. A drop in market capitalization combined with a cash balance from a recent financial statement that is much higher than the true cash balance can combine to create negative enterprise values for some firms. This discussion has been premised on two assumptions, that debt is a source of capital and that cash is a non-operating asset to businesses. There is a subset of the market where both assumptions break down and it is especially so with financial service companies, where debt is more raw material than source of capital and cash & marketable securities cannot be claimed by investors. With banks, investment banks and insurance companies, the only estimate of value that should carry weight is the market value of equity. You can compute the enterprise values for JP Morgan Chase and Citigroup but it will be an academic exercise that will yield absurdly high numbers but will provide little information to investors. To illustrate the difference between the different measures of value, I first screened for global non-financial service companies with market capitalizations exceeding $25 billion and computed the firm and enterprise values for each of them. You can download the entire spreadsheet of 292 companies by clicking here. I then created a list of the top 20 companies by market capitalization and ranked them based upon the other measures of value as well. Apple is more valuable than Google, if you use market capitalization as your measure of value, whereas Google is more valuable than Apple, if you use enterprise value, and GE dwarfs both companies, based upon enterprise value, because it has $415 billion in debt outstanding. Note that much of this debt is held by GE Capital and given my earlier point about debt, cash and enterprise value being meaningless in a financial service company, I would view GE's enterprise value with skepticism. Nothing in this table tells me which companies are good investments and which ones are over priced and all the caveats about mixing market and book value, timing differences and missing numbers apply. Why have different measures of value? Having multiple measures of value can create confusion, but there are two good reasons why you may see different measures of value and one bad one. The measure of value that you use can vary, depending on what you are planning to acquire as an investment. 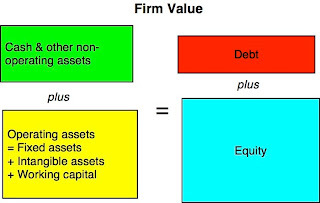 For instance, in acquisitions, where the acquiring firm is planning on acquiring the operating assets of the target firm, it is enterprise value that matters, since the acquiring firm will use its own mix of debt and equity to fund the acquisition and will not lay claim on the target company's cash. In contrast, if you are an individual investor in a publicly traded company, the market capitalization may be your best measure of value since you have little control over how much debt the company has or how much cash it holds. In fact, enterprise value based calculations can be misleading for individual investors, since they can mask default risk: a firm on the verge of default can look cheap on an EV basis. In some cases, the choice of value measure may depend upon the agenda or biases of the analyst in question. Thus, an analyst that is bullish on Apple will latch on to its enterprise value to make his or her case, since it makes Apple look much cheaper. When it comes to which value estimate is the best, I am an agnostic and I think each one carries information to investors. The PE ratio may be old fashioned but it still is a useful measure of value for individual investors in companies, and enterprise value has its appeal in other contexts. Understanding what each value measure is capturing and being consistent in how it is computed, compared and scaled is far more important than finding the one best measure of value. Thanks for the post professor! But Investment Bankers do it all the time, so it can't be that hard, right? I am not sure what you mean by control premiums not being considering in equity valuation. Are you asking why I don't just add 20% to my DCF value to get a value of control? That may be par for the course in some circles but it does not cut it with me. I have a paper on the value of control on my website that lays out what I think about the value of control and how best to estimate it. Professor Damodaran, thank for for some excellent insights as always. I have one question in relation to the point you make about adding the value of options outstanding to the market capitalization to arrive at the market value of equity for a company. Is this done by taking the aggregate intrinsic value of total options outstanding as disclosed in the notes to financial statements and adding it to the market cap? Also I assume market cap on this basis should be the basic rather than diluted number of shares in issue x share price, to avoid double counting with regard to the options? Right on both counts. The options have to be valued as options (which should be par for the course now since they are valued as such for expensing purposes) and the market cap should always be based upon primary shares outstanding (to prevent double counting). When searching for the most appropriate and reasonable multiple to apply to an entity as a going concern , wouldn't FCFF for the firm and FCFE for equity be a better proxy for the cash that will be generated,( - the capex) , than earnings or EBIT (and certainly EBITDA)? I find that market value of Equity is extremely difficult to determine. If Equity shares are traded, then it is somewhat easy. But even marlet price of share is determined more due to market perception , rather than fundamentals. If the Company falls under FMCG sector, most of the market price is determined by future perception of earnings, thereby the share commanding very high P/E ratio. Same is the case with Finance & banking shares. In Indian conditions, determining the exact Enterprice value is a tough task. However I must thank the Professor for very useful discourse . Is it plausible to use the cash flow statement (changes in current assets and liabilities) to determine the operating Cash requirements of a business? The whole point of using multiples is to keep it simple and avoid computing free cash flows. That is why you use earnings or book value. Market value is extremely easy to get and all multiples are based on market value. It is intrinsic value that is more difficult. The whole rationale for using relative valuation, i.e., comparing companies based on how the market is pricing them, is to avoid estimating intrinsic value. When calculating net debt for enterprise value, most academic formulas use long-term debt + current portion of long-term debt. Isn't that missing some debt? I feel like other liabilities (classified under long-term) and other short-term liabilities (accrued expenses)and making sure working capital is positive should all be added to the debt portion of enterprise value? Enterprise value is almost never used in academia. It is more of a practitioner construct. That said, it should be all interest bearing debt (including lease commitments capitalized and treated as debt). But shouldn't non-interest bearing liabilities be added? If a company is acquired these are deducted before equity gets anything. can u please explain with an exmaple how to treat options in calculating market value of equity ? Content is the greatest source for expressing your feelings, throughts and precious time. Your post is fabulous and very meaningful. I have the same question as Vicky, I'm still unsure how to treat options in calculating market value of equity. Thanks! You offer different definitions for firm value and enterprise value. Standard practice in the banks I have worked in and for is that the two are synonymous, the second being a term introduced to replace the first to reduce the risk that the first could be misinterpreted as using firm in the sense of solid or definitive. That most of authoritative of sources, Wikipedia also has the two terms as synonymous at http://en.wikipedia.org/wiki/Enterprise_value . How long have they been used distinctly in academia, and how widespread is the practice? On the question of option value, here is what I would do: value the options using an option pricing model (a modified version of the Black Scholes, with modifications for dilution and early exercise) and add it on to the market cap. On non-interest bearing liabilities: they are netted against current assets and show up on the asset side as net working capital. To David C.: You may be right about standard investment banking practice and Wikipedia, but I view neither as authoritative or particularly well informed. Dear Aswath, Your blog is great and I am following it since the start of my Ph.D. program. Concerning your last post I have a short comment since my first research paper dealt with market value of equity of Deutsche Bank back in the 1990 and which share had been derived from its numerous industrial shareholdings. You write “the market value of these holdings should be netted out to get the enterprise value of the parent company.” In my opinion, only the AFTER TAX VALUE of these holdings should be netted out because that is the value which can be realized (comparable to the discount of trapped cash). Hi professor - sorry to bring up the options again but I deal with this regularly and I've seen two approaches so was wondering if you could clarify. Let's say we're going from aggregate EV to a share price valuation assuming no debt. One way (1) is to add the option exercise consideration with other cash before dividing by fully diluted shares outstanding. This is basically deducting the intrinsic value of outstanding options and then calculating a share price without the circular reference in excel. The other way (2) would be to deduct the outstanding option value (including time value) via a black-scholes style valuation from EV as though it were like debt and then calculate the share valuation from the remaining value and real shares outstanding. Honestly no. 2 seems more right to me, but I see no. 1 more often. Could you provide any guidance? The first approach that you describe for options is the treasury stock approach and it basically values the options at exercise value. The intrinsic value of an option is not its exercise value and an option pricing model is designed to compute the time premium on the exercise value. So, you do need to value the options as options and add that value to the market cap to get the total market value of equity. Good point about taxes and here is the reason it is a thorny issue. The question is not whether taxes would have to be paid on the cross holdings if you liquidate the holdings but whether the market is building in an expected tax liability when pricing the company today. I you are a passive investor looking at a company with significant cross holdings, there is no reason to believe that the market is already assuming liquidation is imminent and building in a tax liability into the valuation. Great post Professor, it was very informative. Thanks for sharing! Thank you for this very interesting post. It is really good to have the opportunity to share with you our thoughts. My question is about the value of the cross holdings, and how they affect the Enterprise Value calculations. I see and agree with you on the equity part, i.e. if a company has a 40% stake in another company you should take into account just the 40% of the Equity Value and not the 100%, but regarding the debt value of a cross holding, sometimes adding just the 40% of the debt in the subsidiary can be wrong. In some cases the main shareholder of the company is going to be in charge of the whole amount of the debt, for example, in the case of default of this cross holding company. In this case I think that including the 100% of the debt of the cross holding company is OK.
Do you agree with my reasoning? Professor Damodaran thanks for the post. i am a veteran reader of your posts and enjoy each and every one of them. 1. sum the market prices of all the traded bonds serieses. then devide it by the par value. this calculation wiill give you the ratio price/par (which equal to 100%-expected haircut). lets call this ratio "A"
2. due to the fact that not all the unsecured debt is traded, so in order to get the price that the market gives to the total unsecured debt you need to multiplie "A" with the total unsecured debt (traded and non traded). lets call this figure "B"
3. add to "B" the total value of the secured debt (you can take the collateral value of the total secured debt value from the financial statements). this will give you the value that the capital markets give the company's assets. what do you think of that methodology? i assume that if you use such methodology - your hidden assumption is that the total debt value (secured + unsecured) equal to the total assets value - which means equity value of zero. when it is reasonable to take such assumption? can i find in this blog some insights/articles on financial restructuring/debt to equity swaps and financial distress situations? if not - can you please refer to a good and reliable source for a self study? Thanks for the great post Professor, you always have insightful articles that I learn from! I am a practitioner of the dark art of corporate credit analyis in a commercial banking environment. We look at Equity/Assets ratios as one credit rating factor, and typically adjust them for "market" by calculating Enterprise Value in the normal way and using that as a proxy for Total (market-adjusted) Assets. 1. how can you say Enterprise Value doesn't mean the market value of Total Assets, of course it does! 2. 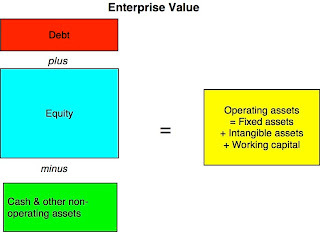 If Enterprise ISN'T the same as the market value of Total Assets, what exactly is it? thank you for your elucidating article to the topic of valuation. Nevertheless, one question has come up with me regarding working capital in your pictures. As far as I know, working capital is defined as the non-interest-bearing part of the difference between current assets and current liabilities. With a view to the three illustrated financial balance sheets in your article, I think it's not difficult to see, that the subtrahend in working capital, namely the non-interest-bearing current liabilities like e.g. accounts payable are double counted, because they are part of the debt in red marked box, too. 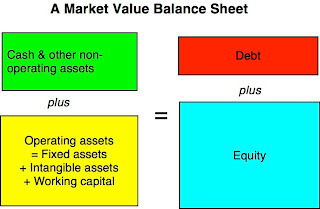 Therefore my question: Why don't you use "non-interest-bearing current assets" instead of "working capital" in the yellow box respectively "debt minus non-interest-bearing current liabilities" in the red box? 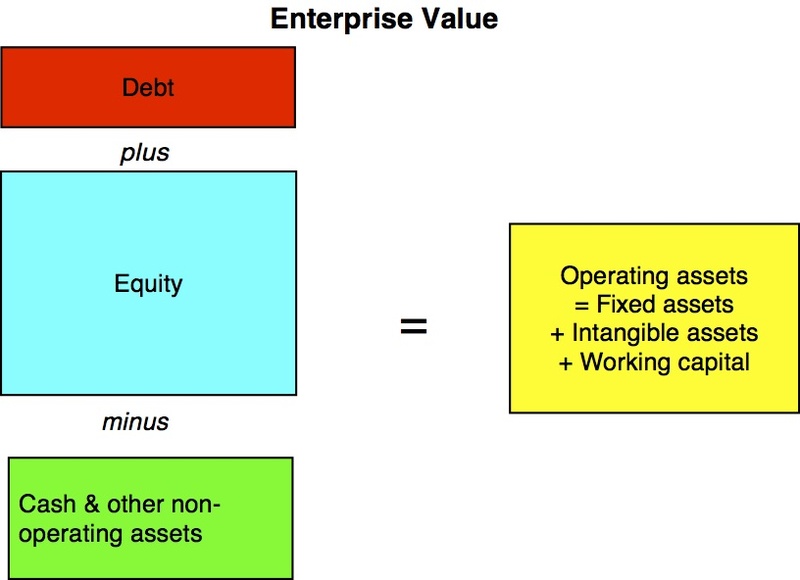 Furthermore, my suggested first alternative for the yellow box would visualize in your third picture the enterprise value as pure sum of operating assets much more, wouldn't it? I'm curious about your answer. Thanks for posting a detailed note on all values relating the enetrprise and of the firm like investments, market values and equity. This will be of great use to the firms handling payroll and resource planning like that of the ERP software companies in Dubai. If we have to compare companies in a sector using EV/EBITDA and EV/Sales multiple should we use average market capitalisation and debt (Opening + closing) for the year or just the closing numbers. I think that since sales have accrued over the year and so has EBITDA, hence using the average numbers make more sense. your blog is very helpful.. I am happy to find this post very useful for me, as it contains lot of information. How can you possibly replace accounting values by market values in Balance Sheet and still balance it ? I don't get it. The equity will increase if P/B >1 and debt will also increase if rates are now lower. Which asset will balance these changes in Balance Sheet ? Can you kindly explain. Thanks a lot. What are your thoughts on trade payables balances as debt and valuation techniques? In undertaking a firm valuation, if you could estimate the implict rate of debt charged by suppliers on inventory where payment is delayed (i.e. sold on credit)wouldn't it be correct to add this implicit interest back in doing a DCF calculation? The Indian stock market has slipped into the red after opening notably higher this morning. Profit taking after Wednesday's gains and a weak rupee have dragged down stock prices.Bank, capital goods and oil stocks are trading lower. You’ve got it, whatever that means in blogging. Anyway, You’re definitely someone that has something to say that people should hear. Keep up the wonderful job. Keep on inspiring the people! This may seem very strange. But the market cap of a stock compared to the companies annual sales is by far the best way to determine if a stocks is really undervalued. A company thats does one billion dollars in annual sales but has a market cap of just one hundred million has a great advantage over other stocks that lack this ratio. Evaluating the value is the most important part of this process, I agree. What are some of the best ways to figure out the market value of your businesses equity? I really appreciate any feedback! If the Non cash Current Assets are comfortably > Current Liabilities, would it be safe and correct to included the entire cash on the BS as excess cash? And how would you discount the trapped cash situation in the model? by just excluding the trapped cash from the total cash? I am a newcomer to valuation & finance theory in general & passionate about learning. I have one question: In an acquisition situation where a comparable EBITDA multiple calculates the enterprise value of the target firm, it is correct to assume that Net debt should be removed from the EV figure & the acquisition price of the shareholder is should this be based on the Equity Value? What are your views on Joel Greenblatt's magic formula, where he uses Enterprise value to pick stock for investment. Nice Blog Posting ! Selective Financial Services is an investment and advisory firm that strives to provide expert solutions to create lasting values, for investors, in transactions in which we invest funds, or our financial expertise, and for the companies and individuals. I have read your blog. It’s very interesting and informative too.Thanks a lot for sharing a little information. You can also visit our website for more information. Having the right information on the ads displayed on your site and being able to control them, is a big ask we hear from publishers. Many of you are already using the to review and control these ads. From today, enjoy more choice with new updates designed to save you time and give you more control in the review process. Save time by not having to review the same ad twice. Now you can see which ads you’ve already reviewed by selecting the ‘Show reviewed ads’ checkbox in the top right corner of the Ad review center. thank you sir admin has presented useful information and news which, hopefully with updated often will make this website more useful to visitors. can i replace EV to Firm Value from EV/EBITDA or EV/EBIT? If we assume that all cash & cash equivalent in the firm is operating & therefore nothing is required to be deducted while calculating EV, can we say that in such circumstance, EV = Value of firm calculated by DCF approach ( FCFF discounted by WACC) ? hello sir, iam a phd finance research scholar, i want to know about firm value in clear terms, what are the aspects to be covered under it and its scope, kindly send me about it. Thank you. Dear Professor, why is EV/EBITDA ratio of real estate firms higher than the average of other industry? Comparing a real estate firm and a retail firm of the same EV, shouldn't the EBITDA be higher for the real estate firm which has a higher depreciation and amortisation as well as a high capex? Dear Prof, Will Insurance Funds and other class of funds be added to equities market capitalization in determining the enterprise value for an insurance company given that Insurance Funds are debt obligation of an insurance company to the insured. I will appreciate quick response to this. How does restricted cash fit into all of this? Thanks for all the great advice and information found on your website. I was wondering if you could shed some light on a small issue i have. Currently doing a hotel valuation. Managers have asked me to include a metric stating enterprise value per room. Their argument for including the metric is that investory will look at the metric to see if its actually worth buying the hotel and foregoing the effort as opposed to replicating it themselves. By introducing this metric i am of the view that the better the hotel performs (ie. higher operating cash flows) the higher the enterprise value per key. So, in a sense the hotel owner is being punished for doing well because it drives up his enterprise value and then makes an investor think that he can replicate the hotel for a cheaper cost. I am of the view that such a metric should not be introduced as it punishes for good performance.